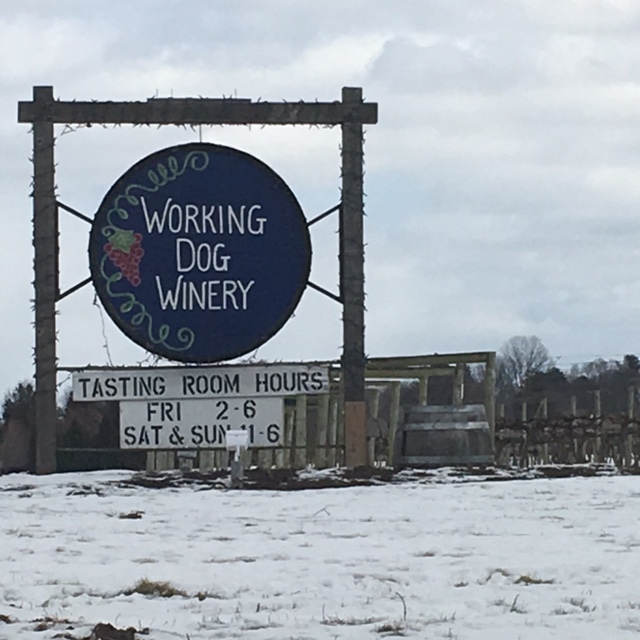 Looking for another New Jersey winery to visit last weekend presented me with a lot of choices, but I narrowed it down to one the moment I saw the name: Working Dog Winery, in Robbinsville. As someone who volunteers at the Sammy’s Hope Animal Shelter in Sayreville on weekends, the winery’s name and logo were already enough to get me there. A couple days before, I’d emailed to ask if I could meet the winemaker and perhaps get a tour. Lo and behold, a very genial guy named Mark Carduner called me, said he was the winemaker and would be glad to host me. 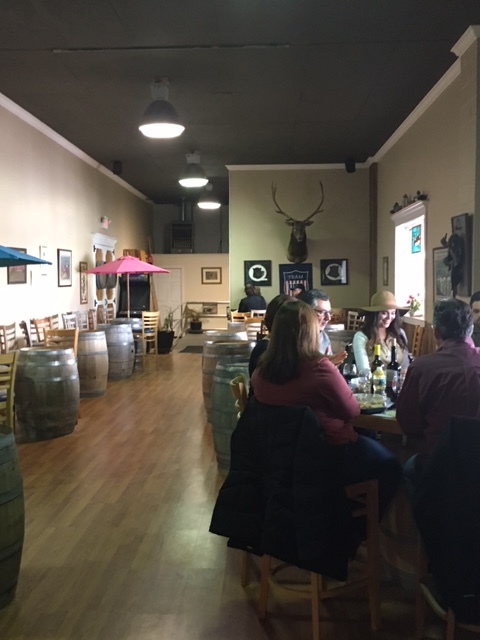 And when I walked in, he was the first person I saw, at the front of a modest-sized, warm and friendly tasting room, that was about half-full including one table – an old wine barrel, actually – where a large group of people were sipping wine, munching snacks and playing cards. They obviously felt right at home. That modest tasting room actually led to another, much larger tasting room, similarly appointed with wine-barrel tables, and views out onto a large terrace with picnic tables. Beyond were rows and rows of grapevines. Even in the winter, a vineyard never fails to captivate me. But first things first. On a tour of the property, Mark showed me where several expansion projects were in the works, enlarging the working area of the winery, with more space for fermenters and barrels. After we walked into one room, where wine is aged in stacked barrels made of American, French or Hungarian Oak, Mark excused himself for a moment, and returned, as I thought he would, with a little gadget called a “wine thief.” And it’s just what it says, a long tube that looks like the business end of a turkey baster, which is inserted through the “bung” into a barrel of maturing wine so that the winemaker can taste its progress and figure out what to do next, and when to do it. 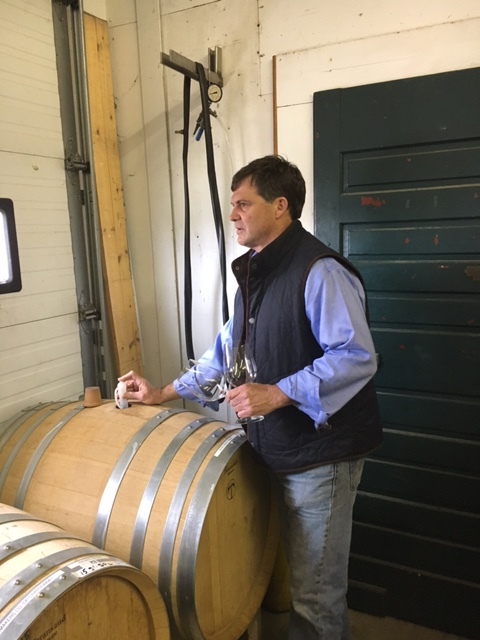 So for the next half-hour I was treated to barrel tastings of young wines – the 2016 vintages, which would have been crushed and fermented in August or September of last year – and which were gaining flavor, complexity, nuance and aroma. First up, and much to my delight and surprise, was Viognier, a rich, somewhat viscous and very aromatic wine that often has floral aromas and flavors of apricot and peach. I don’t know of any other Jersey winery that grows it, and with a scant four barrels, which will produce about 2400 bottles or a mere 200 cases, I’m sure there won’t be any left a week after it’s bottled and up for sale. I’m reserving my case! We moved on to taste the 2016 Syrah/Viognier blend. That’s right, this is an unusual mix of wines made from both a red and a white grape. It’s known and prized from where most of it comes, France’s norther Rhone Valley, in an area called the Cote-Rotie or “roasted slope.” Although still maturing, it has that wonderful quality of the blend, in which the meaty and tannic aspects of the Syrah (also known as Shiraz in Australia) are tempered by the lovely flavors and aromatics of the Viognier. For the next two and a half hours, Mark showed me around, even driving me in his heavy-duty pickup out to a far corner of the property, a new parcel where five acres of vines will be planted to Sangiovese, Cabernet Franc and Viognier, and which had recently been re-graded to ensure good soil draining. That’s very important if you don’t want mildew on your grapes. Mark pointed out, as well, how they’d created a channel so that air cannot settle and freeze those grapes in colder weather. This was clearly a guy that known how to manage a vineyard, and one that’s growing year over year. And it’s not a tiny place: This winner of the 2007 New Jersey Winery of the Year has 18 acres under vine with those additional five being planted, and another 20 acres or so that could provide expansion for the future. His story and the story of the winery aren’t typical, if there is such a thing. Mark, his father Robert and brother Brian owned and operated two wine stores in tiny, nearby Hightstown NJ. In 2000 they sold the stores, and a year later, after four friends kicked in to become partners, they planted their first vines – Chardonnay, Cabernet Franc and Chambourcin. New vines take about three or four years to produce decent fruit, and their first vintage was 2004. The Winery was originally titled “Silver Decoy,” with a duck icon, but ran into Napa-based arrogance in the form of Duckhorn Winery, which wants to be the only duck in the business. Rather than fight a long and expensive legal battle, the five partners changed the name and logo in 2013. 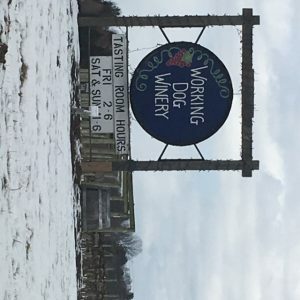 But it was a good name change, in honor of the winery’s first “working dog” Chester, a beautiful Black Lab who crossed the Rainbow Bridge in 2011 and is buried under the flagpole. This is a small winery by most standards, producing only about 3,900 cases in 2016. By contrast, an extremely small Napa winery might produce, say, 20,000 cases. But that still meant Working Dog’s workers crushed 55 tons of grapes! In 2012, Working Dog participated in “The Judgment of Princeton,” a tasting that pitted top French wines against New Jersey wines. It was modeled after “The Judgment of Paris, the famous (if you’re American) or notorious (if you’re French) 1976 contest, in which two California wines, a Chardonnay and a Cabernet, bested French wines in a blind tasting conducted by French judges. At the Princeton tasting, which was led by George Taber, the Time magazine journalist who covered the Paris event, the nine wine judges were from France, Belgium and the U.S. Although the winner in each category was a French wine, Clos de Mouches for the whites and Mouton-Rothschild for the reds, Jersey wines did well: three of the top four whites were from New Jersey, including a Working Dog Chardonnay, and another Jersey red ranked third. And…the prices for the NJ offerings were a fraction of the top French wines. Pinot Grigio (Pinot Gris) 2015: Working Dog cold-ferments this, producing a very bright and fruity white. Santa Margherita it’s not. Thankfully. Chardonnay 2014: A very bright and light example of the most popular American wine. Chambourcin 2014: This hearty French-American hybrid grape generally makes a light, easy-drinking red. This one is ever-so-slightly spicy and a nice way to introduce red wine to habitual white wine drinkers. Merlot 2014: Substantial and nicely balanced. Not your grandfather’s Merlot. Cabernet Franc 2014: This grape is often used in Bordeaux blends and some say it’s a less-muscular, more “earthy” version of Cabernet Sauvignon. This one is lovely, with bright cherry flavors and a wonderful aroma. Syrah 2014: Medium- to full-bodied with hints of mint and smoke. Reserve Chardonnay 2015: For fellow wine geeks, this is 100% malolactic fermented. That means that the wine gets a second fermentation that converts brisk, tart malic acid into softer lactic acid. Here it has worked wonders, and this is a lovely wine. Reserve Cabernet Franc 2014: Also for wine geeks, this spent 20 months in new American oak. The wine menu says dark cherry flavors and a cola finish…and I agree. Retriever 2014 – This Bordeaux-style blend of 50% Cab Franc, 40% Merlot and 10% Cabernet Sauvignon is in memory of Chester. The blend is reminiscent of wines from the famous Chateau Cheval Blanc in the St. Emilion wine region that can routinely fetch $600 a bottle or a lot more. This isn’t that, but it’s very nice. And it’s not $600.